Each decade since 1979, the U.S. Department of Health and Human Services (HHS) has published a comprehensive set of national public health objectives. Known as Healthy People, this initiative is based on the premise that setting objectives and monitoring progress can motivate action. Healthy People is not only valuable as a Federal goal setting report, but also as a forum for health leaders and individuals across the United States to get involved in directing the nation’s public health strategy for the future. Produced through a process of broad stakeholder engagement, it represents the input of key stakeholders in public health at the national, state, and local levels, as well as the general public. A central theme of Healthy People is that communities and community partnerships play a pivotal role in promoting healthy living in the U.S., and addressing factors in the physical and social environment that shape the health of Americans. The most recent iteration of these objectives, Healthy People 2010, is the third in a series of HHS publications that specify ten-year health promotion and disease prevention objectives for the nation. Healthy People 2010 consists of 467 objectives, organized into 28 focus areas. It has two overarching goals: (1) to increase the quality and years of healthy life, and (2) to eliminate health disparities. Studies modeling the potential impact of Healthy People 2010 suggest that achieving certain objectives would lead to significant increases in the longevity and health of the U.S. population; these effects would be augmented by achieving the goal to eliminate health disparities (Pamuk, Wagner, & Molla, 2004). Because stakeholder involvement has been essential both to developing and achieving public health priorities for the nation, Healthy People 2010 has been called a “national” effort, rather than simply a “federal” one. Coordinated efforts among federal, state, local, and tribal public health entities are necessary to achieve this end. 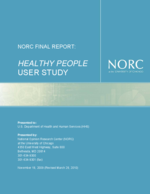 The Office of Disease Prevention and Health Promotion (ODPHP) and the Office of the Assistant Secretary for Planning and Evaluation (ASPE) decided to conduct the 2008 Healthy People User Study (2008 User Study) to better understand how public health agencies and organizations are using Healthy People, and to identify barriers to the use of the objectives. This information will assist HHS in evaluating the usefulness of Healthy People 2010 and developing strategies for improving the utility of Healthy People for state, local, and tribal health organizations/agencies. Additionally, the information will provide valuable feedback as HHS prepares to launch development of the next decade’s health promotion and disease prevention objectives for the nation, Healthy People 2020.